The Watauga River is located in Elizabethton, about an hour from Asheville. Like the South Holston River, this river is widely known in the east as one of the top fisheries because of the high fish counts. The only downfall of this great river is the lack of access. The river starts at Banner Elk near Boone Lake. From the beginning of the river to highway 1580 the river runs through private property. From highway 1557 bridge highway 105 bridge and from NC 1114 bridge to NC 194 bridge the river has delayed harvest regulations. This is about 2 miles of delayed harvest. There is good access along Shulls Mills Road with several parking areas to select from. This is not a stream you would book your whole vacation around, but if you are in the area you should give it a shot. There are nice size trout in this stream and it is a typical trout stream, meaning you will find the fish where you think you should. You can wade the Watauga or float it with a tube or drift boat. Sometimes floating works best in the summer when it can be crowded. The upper section by the dam provides some of the best fishing in the spring or fall, and this is where the river holds some of the bigger fish. The middle section and the lower section fish very well all year long. The lower section of the Watauga is also referred to as the “trophy” section, but these large fish can be tough to catch, as this section will see a lot of pressure. 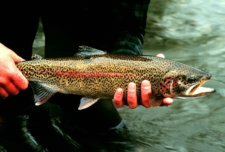 The best time to fish the Watauga is springtime which has some of the best hatches. This is a popular fishery for East Tn fishing. Some of the hatches you will see will include Blue Winged Olives, Caddis, Crane flies and Sulphurs. Catching these trout on the dry fly is what makes this river so inviting to the fly-fisherman. Leave the Watauga River page and return to North Carolina.